Description: Classic handmade scroll invitation box made of cream texture paper has an artistic laser cutout in the centre. 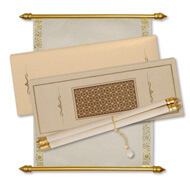 The box accomodates cream non woven scroll with gold foiled borders and goold sticks. The box comes with a matching envelope.